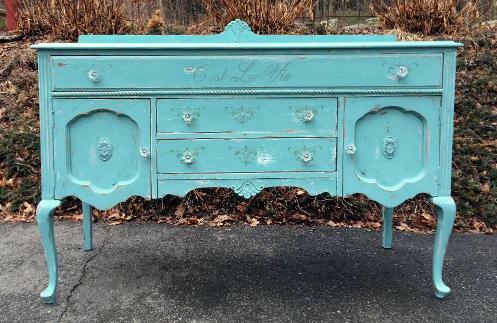 If you love Shabby Chic Sideboards, Vintage Distressed White French Stenciled sideboards, Simple Beach Cottage Sideboards, Painted Cottage Sideboards or Romantic Cottage Decor, Welcome! Our selection changes often, contact us if you have a special request! French Stenciled Sideboard A Painted a gorgeous shade of creamy white with French grey dry-brushing, we have distressed her just right! and added ~time worn~ French stencils to her drawers, top and doors. We have achieved a patina that looks as if she has been lovingly used for 50 years. Restored inside and out, new crystal pulls with a gorgeous French Blue interior. Oh! LaLa! Painted a gorgeous shade of Provence Annie Sloan Chalk Paint, we have taken this pretty, petite sideboard to another level by adding a French bee stencil. Distressed in all the right places! Classic Beauty sideboard! If you love Shabby Chic sideboards with classic romantic lines, this piece is the perfect piece for you! 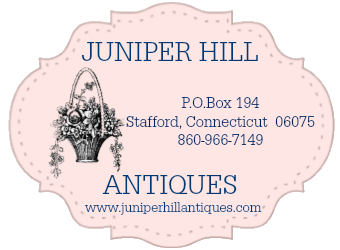 Done in Juniper Hill Antiques creamy white, we have added a beautiful rose garland to her bottom drawer and new crystal knobs to her doors and drawers. Lots of storage space in this classic beauty, she is painted inside and out. Her double doors open to storage cubbies. Perfect for a dining room, family room or entry hallway. We have added a protective coating to her top for durability and maintenance. Vintage French Farmhouse Sideboard! This awesome Farmhouse style sideboard is the perfect shade of Duck egg blue with white undertones, distressed just right. We have added Time-worn wreath and number stencils to her drawer fronts an harlequin stencils to her top to add charm. Her interior drawers and cabinets are painted country white, perfect to store your "pretties". Tons of storage for a dining room or kitchen, perhaps she could be used for a bathroom vanity or craft room storage! French Stenciled Sideboard B We have restored this amazing 1920s sideboard to absolute perfection! 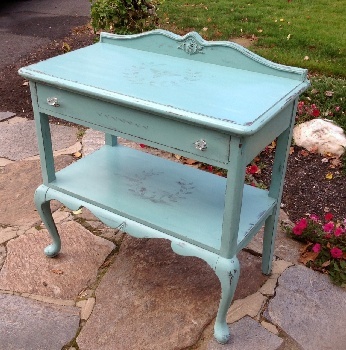 Painted a gorgeous shade of French teal with white undertones, we have distressed her just right! 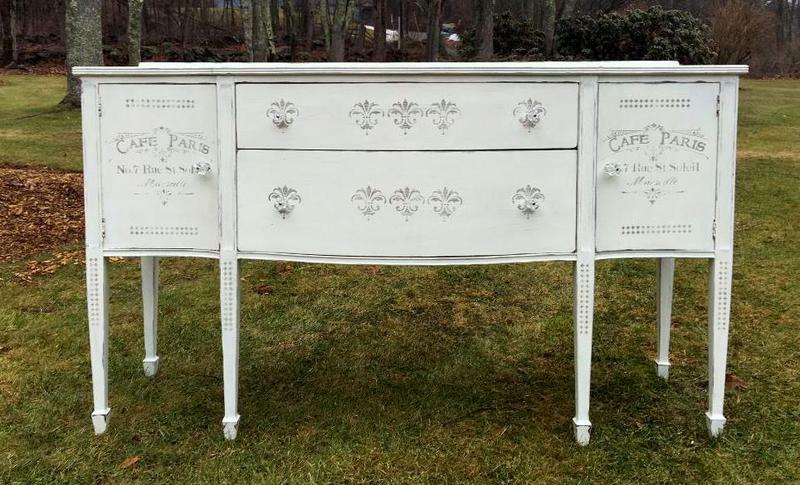 and added timeworn French stencils to her drawers and top. A beautiful harlequin stencil with French advertising has been added to the top surface. Wonderful ~time worn~ wreaths, French script and French wreaths are abundant on her exterior along with the beautiful saying "Cest La Vie" (meaning "such is life") on her top drawer. New crystal knobs have been added.